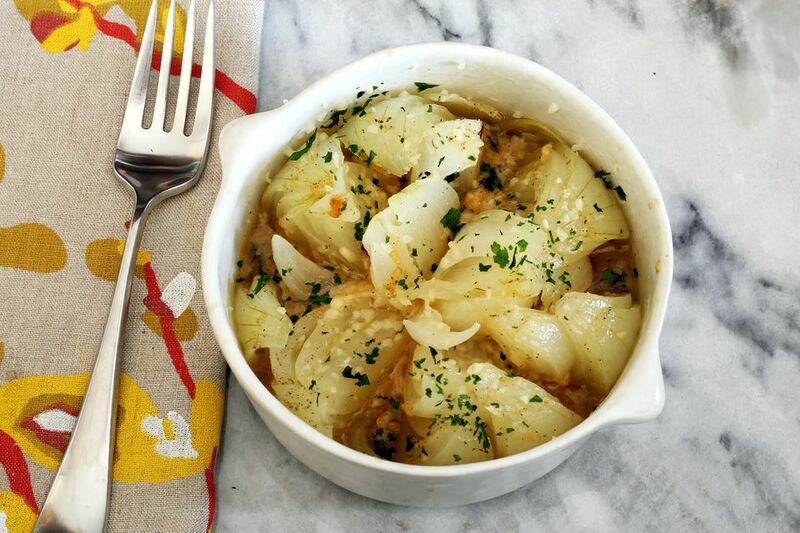 These soft, buttery baked onions offer incredible sweet flavor, and they take just minutes to prepare. Vidalia onions can be quite large, so two onions might suffice for four people. The Vidalia onion has a wide, flat shape, which works well in this recipe, but feel free to use Walla Walla, Mayan Sweet, or another variety of sweet onion. For serving, scoop the baked onion into a small, deep bowl and pour the juices over it. Sprinkle the baked onion with additional cheese and chopped chives or parsley if you like. The onions make a fabulous side dish with grilled or broiled steaks or chops or serve them as a luncheon dish along with soup or a salad. Peel the onions. Shave the roots a bit to neaten them if you like, but don't remove the root end. Cut each onion into eighths, cutting just to the root, but not through. Very gently separate the layers of the onion slightly. Place each onion on a large, lightly greased square of foil. Cut 1 tablespoon of butter into very small pieces and scatter the pieces over the onion and among the layers. Sprinkle the onion with salt and pepper and about 3 to 4 tablespoons of the Parmesan cheese. Repeat with the remaining onions. Wrap the foil around each onion to seal and arrange them in a 9-by-13-by-2-inch baking pan. Bake in the preheated oven for about 1 hour.